I’m excited to share with you some of my favourite eyeliners – the ones I love and use again and again in my pro makeup kit. Whether you are looking to achieve a crisp winged line or a smudgy smokey eye effect, a good eyeliner is a must for every makeup bag. Every girl needs a great black eyeliner as well as a few other alternatives such as browns, golds & greys which are perfect for a more mature lady or as a daytime/more natural look. I love this eyeliner, it has a smooth, smudge-proof gel eyeliner with long-lasting, intense colour pay-off and excellent coverage. Gorgeous colours… my favourite is Sienna which is a beautiful deep brown, perfect for my wedding makeup clients. This is a soft pencil liner that lines, defines and shades the eyes with rich colour and a silky-smooth, matte/pearl finish. The colour is a warm brown which is flattering for all eye colours, it’s a great alternative to black for a softer/warmer effect. Gel Eyeliners are so much easier than liquid liners to achieve a winged eyeliner effect. This one is smudge proof and waterproof for 24 hours, OK for sensitive eyes and is a very dense black. 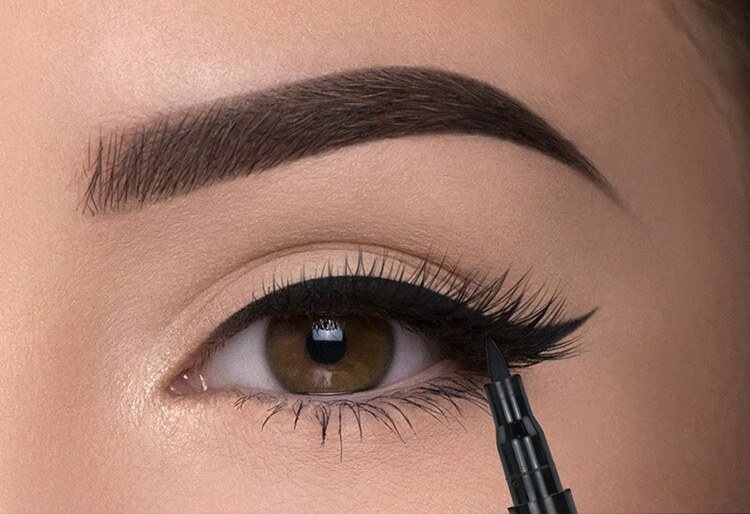 Use the brush provided to glide the liner across the lash line from the inner to outer corners. I love this eyeliner because it is very intense with a slight shine and is quite sticky which allows you to drag it along and blend out into a thicker or winged line (perfect if you’re not very confident as it gives you time to make any changes). This liquid eyeliner is water-resistant with a pigment-rich formula that stays put until you take it off. Plus is infused with Bio-Boost Complex™, a 100% natural algae that helps stimulate hair follicles to improve the length and fullness of lashes. It goes on without skipping, running or smudging to create ultra-sharp, super definition. Make-up Artist Leeds – Harrogate – Ripon and the North Yorkshire area. For more information about my wedding makeup or makeup lessons contact me.